Endocrine Disruption and Human Health starts with an overview of what endocrine disruptors are, the issues surrounding them, and the source of these chemicals in the ecosystem. This is followed by an overview of the mechanisms of action and assay systems. 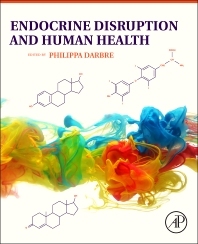 The third section includes chapters written by specialists on different aspects of concern for the effects of endocrine disruption on human health. Finally, the authors consider the risk assessment of endocrine disruptors and the pertinent regulation developed by the EU, the US FDA, as well as REACH and NGOs. The book has been written for researchers and research clinicians interested in learning about the actions of endocrine disruptors and current evidence justifying concerns for human health but is useful for those approaching the subject for the first time, graduate students, and advanced undergraduate students. Chapter 1. What Are Endocrine Disrupters and Where Are They Found? 1.4 Which Hormones Are Disrupted by EDCs? 1.5 How Do EDCs Disrupt Hormone Action? 1.6 Which Chemicals Are Sources of Human Exposure to Endocrine Disrupters? Chapter 2. How Could Endocrine Disrupters Affect Human Health? 2.3 Can EDCs Be Absorbed from Dermal Application? 6.8 How Many Other Receptors May Be Disrupted? 7.7 How Does Nonmonotonicity Influence Chemical Safety Assessments? 9.2 What Are the Endocrine Targets for Disruption of Male Reproductive Health? 10.1 Introduction: How Could Endocrine Disruption Affect Cancer? 16.4 How Is Regulation Brought About in Different Countries? 19.2 Where Are EDCs Found in PCPs? Dr Philippa Darbre is Associate Professor in Oncology in the School of Biological Sciences at the University of Reading in the UK. She is an academic scientist who has been carrying out research into estrogen action in breast cancer for over 30 years and has been investigating the role of estrogen-mimicking chemicals since before the term “endocrine disruption” came into being in the early 1990s. She trained as a biochemist and holds the degrees of BScHons from the University of Birmingham, UK (1973) and PhD from the University of Cambridge, UK (1977). Her postdoctoral research began at the Molecular Medicine Institute at the University of Oxford where she held the first Nuffield Medical Research Fellowship of the University of Oxford and a Junior Research Fellowship at St Hugh’s College. In 1981, she moved to the Imperial Cancer Research Fund laboratories in central London (now Cancer Research UK) where she became Head of the Cellular Endocrinology Laboratory. In 1991, she moved to the University of Reading where she has completed now 23 years of service carrying our research focused on breast cancer and engaging in undergraduate teaching in the areas of biochemistry, molecular cell biology, endocrinology and cancer. She is currently programme advisor for the undergraduate biochemistry degree programme and has four overseas postgraduate PhD students. She is on the editorial board of two scientific journals, has written two previous books on molecular biology methods, has guest-edited a previous journal volume on endocrine disrupters and has published over 120 peer-reviewed research papers. She is a patron of the charity ”CancerActive”, is a member of the pool of scientific advisors to the European Union Scientific Risk Assessment Advisory Committee on Health and Environmental Risks, and is a member of the scientific advisory board of the Halifax project (Canada) on environmental long-term low-dose mixtures and cancer.